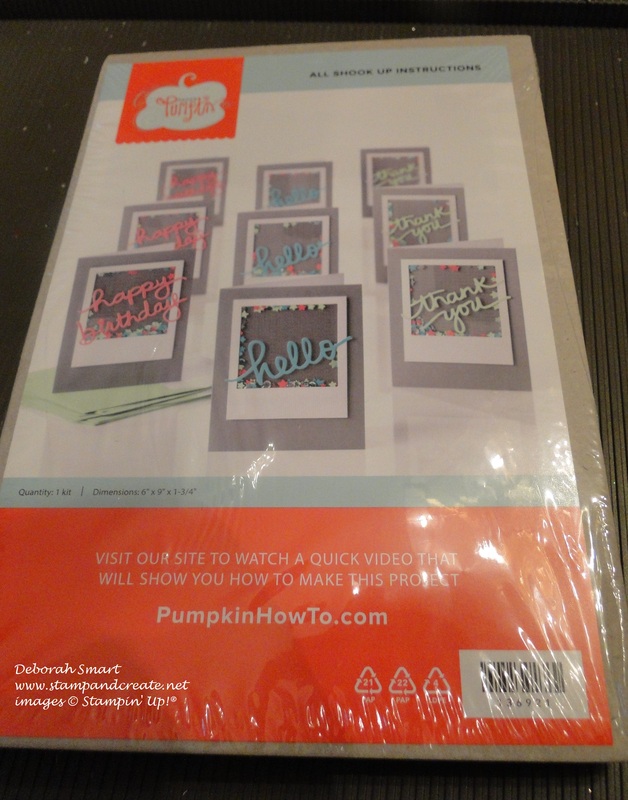 I have to tell you – I just LOVE this month’s Paper Pumpkin Kit!! In fact, I love it so much, that I’m offering a class based on the refill kit that’s available! Now, I’m the first to admit that I was one of those people who jumped off the Paper Pumpkin bandwagon several months after it first started, over a year ago. I had been disappointed in the quantity, and quality, of the projects. In fact, a lot of us demonstrators felt that the kits just weren’t up to Stampin’ Up!’s usual fabulous quality, and we told them so – in droves! So Stampin’ Up! listened, and boy, did they listen well! The quality of the products improved tremendously, as did the quantity and variety of projects in each kit. After waiting, and watching, and seeing how the kits were improving, I jumped back on to the Paper Pumpkin band wagon (or is that a coach? ), about 6 months ago, and I haven’t looked back! I’ve taken the kit out of the box; at first glance it doesn’t look like much, because everything is carefully wrapped up, so as not to lose 1 precious piece! But you can see the picture on the front, which shows you what your final product will look like; it even includes the site address to go watch a video on how to put the kit together (there’s written instructions on the inside, but sometimes a visual helps). Then as you unwrap the cellophane, you lay out all the goodies that come in the kit! Yes, ‘oohing’ and ‘aahhing’ are optional, but it’s pretty much guaranteed that you’ll do it! Besides all the paper products and bling, the full kit (which is what you get as a subscriber to Paper Pumpkin) also comes with the stamps & ink spot! In 30 minutes or less, spent alone in luxury (or maybe you just ignore the whirling dervish around you – headphones are good for that! ), you create your masterpieces! Go ahead – squeal with delight – you know you want to!! 🙂 Well, I did! 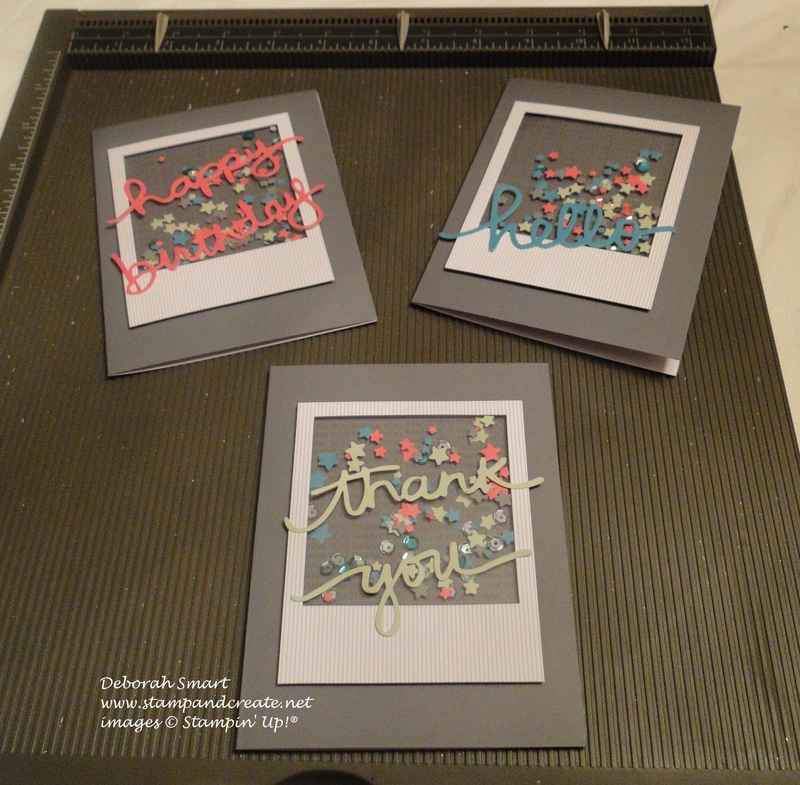 I don’t know if you can see in the picture, but behind the acetate shaker frame, the multiple saying stamp is stamped onto the Basic Grey card base in Smoky slate. Then you cover the shaker area with the included stars and sequins, adhere you shaker frame (doesn’t it remind you of the Polaroid picture frames?! so cute! ), and the adhere your die-cut sentiment across the front. Ba-da-bing; you’re done! Oh, of course there’s the stamp for the inside of the card, as well. Come & make some fabulous shaker cards! They’re all the rage right now; everyone loves them! Each person will receive a refill Paper Pumpkin Kit which contains product to make 9 Shaker cards (3 Birthday, 3 Thank You, 3 Hello) plus lots of left over supplies to make a lot more cards or tags! (the stamps are not included in the refill kit). Cost: $15/person – includes your own refill kit, use of my stamps, adhesives, inks, and refreshments. Register by Jan. 2nd as kits have to be pre-ordered. When you come to class, I’ll also have some samples to show you what you can do with all the great left-over pieces you’ll have. Of course I never throw out the left-overs!! I can’t wait to show you – I hope you’ll come! To register, just give me a call at 604.298.0472 or send me an email at debsmart@shaw.ca, and I’ll save you a spot. But hurry – space is limited, and this fun class will fill quickly! If you can’t make it to this class, how about getting some of your friends together, set a date, and I’ll bring the class to you! You supply the place, the friends & refreshments (tea & cookies will do), and I’ll bring the supplies. 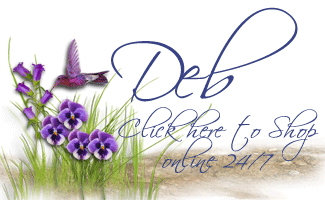 Register soon – I’ll see you in class! Previous Previous post: New Catalogues, New Products, New Classes! Next Next post: Sneak Peek – New Stamp Set!